Amid the rows of stores inside the Westfield Valencia Town Center is one where shoppers will find a variety of products that share one label in common: handmade. TyCam Marketplace, located on the second floor of the mall, is an upscale, permanent venue for local vendors to sell and promote their handmade work. The store held a soft opening Friday and featured 11 artisans’ products that range from greeting cards to wood crafts. The grand opening is slated for Feb. 22. 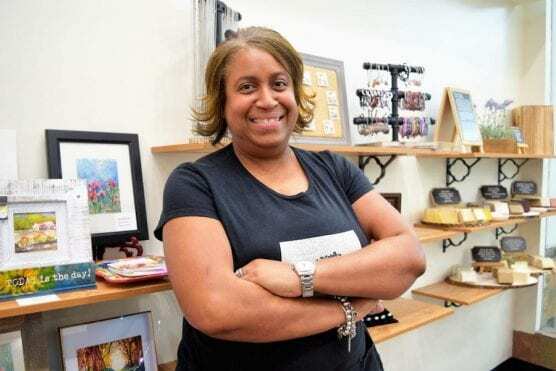 Owner Felicia Smith said the idea came from a feeling she could relate to other vendors as a maker herself. Simply put, TyCam Marketplace is that permanent home “because we deserve it as crafters,” said Smith. The owner, who said the name of the business was inspired by her two daughters Tyler and Cameron, is also a maker herself. The early days of TyCam Marketplace trace back 18 years ago as an online boutique, selling handmade accessories such as scarves, hair ties and gemstone bracelets. Customers can find products, mainly from Santa Clarita Valley residents, including from Valencia High School students, who sell hand-painted greeting cards and natural, gluten-free soaps. To learn more about TyCam Marketplace, visit tycammarketplace.com.